Strong attendance was reported at Optrafair 2016 at the weekend as thousands of practitioners gathered to gain CET points, place orders for new products and network with their peers. The Birmingham NEC exhibition hall featured latest frame designs, lenses, contact lenses, equipment and services, together with an area dedicated to children’s eyewear. Speakers at the event included Specsavers co-founder Doug Perkins and former optometrist Julia Manning, who opened up further discussion on the future of optics following the much-anticipated release of last month’s Foresight report. Robert Morris, founder and creator of eyewear company William Morris, told Optician: ‘The timing of the show is very good because we just launched our new spring summer collection. A lot of customers have not had a chance to see the new designs, which are all on show at our stall with a double decker London bus. 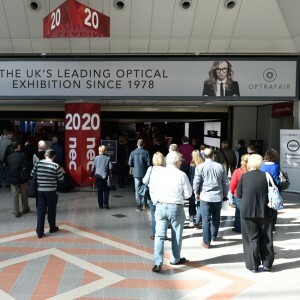 It was the first time Optrafair owners the FMO had combined with new Optician parent company Mark Allen Group, and the majority of exhibitors have already re-booked their stands for Optrafair 2017. The dates for next year’s Optrafair have been confirmed as April 1-3 2017. Read next week’s Optician for further news from the UK’s largest optical exhibition.